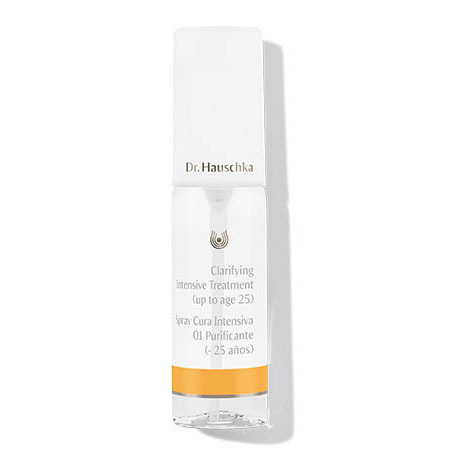 Dr. Hauschka Intensive Treatments are formulated for skin that has lost its natural balance and requires focused care. Clarifying Intensive Treatment offers intensive care to teens and young adults during this time of transition. Formulation: Rhythmitised dilutions of daisy and nasturtium with the gemstone rhodochrosite act quickly to balance the skin, diminish the appearance of blemishes, and visibly refine pores. Witch hazel and rhythmitised silver balance moisture, stabilize skin and reduce the appearance of redness. Skin Condition: For very oily and/or blemished skin. We are sorry to hear you are not 100% satisfied with your purchase. If you'd like further assistance finding the product that's right for you, please give us a call at 800-247-9907 9am-noon and 1pm-4:30pm Eastern Standard Time, Monday through Friday. The Clarifying Intensive Treatment is helping to clear-up my teenage daughter's acne. Very pleased with this product and the fact that it comes from nature. Skin cells are renewed every 28 days. Mirroring this same regenerative rhythm, Clarifying Intensive Treatment should be used for 28 days in place of Clarifying Toner. After morning and evening cleansing, mist 4-5 pumps onto the face, neck and décolleté then gently press into the skin. One bottle should provide a full 28-day course. Water (Aqua), Hamamelis Virginiana (Witch Hazel) Leaf Water, Mineral Salts, Fragrance (Parfum)*, Linalool*, Bellis Perennis (Daisy) Flower Extract¹, Tropaeolum Majus Flower/Leaf/Stem Extract¹, Rhodochrosite¹, Silver¹, Alcohol, Lactose.